Aya Nogi of the Denso softball team from Japan is ready to tag former Cerritos High and current University of Hawai’i catcher Heather Cameron on a stolen base attempt in the top of the second inning of last Saturday evening’s game at Fullerton College. Denso blanked a USA Cal A’s select team 2-0 and won all five games played from July 5-10. Photo Armando Vargas. 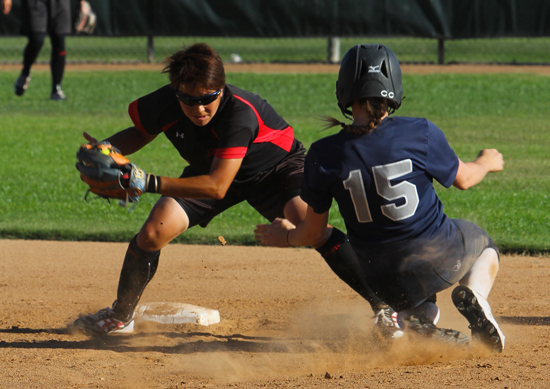 FULLERTON-The Denso softball team from Japan wrapped up its visit to the Southland in fine fashion, playing five games against a USA California A’s select team, then the Cal A’s International team this past Sunday. When the final game had concluded, the team from Anjo, Japan had left lasting impressions on the American players that they will never forget. During these five games in which Denso outscored the different Cal A’s teams 35-1, it wasn’t about the scores. And there was no championship or trophy to play for. It was simply an opportunity for numerous college players, and a few who are still in high school, to see and play against one of the top teams in the world. This past Saturday evening, former Cal A’s head coach and former University of California, San Diego head coach Diana Payan was coaching against Denso for the first and only time of these five games and witnessed her team lose 2-0. It was the closest game of the five and even the Cal A’s had the bases loaded in the top of the seventh inning with a chance to tie or take the lead. The Cal A’s had a chance to score in the first inning as shortstop Kelsey Arnold and second baseman Caleigh Clifton, a pair of University of Oklahoma teammates, reached on walks. However, they would be stranded and the Cal A’s would get only two runners on base until the seventh. Meanwhile, Iseri was solid in the middle innings, averaging 12 pitches an inning, giving up two hits and striking out one. Denso would score in the bottom of the first inning on a run-scoring double from Eri Matsuki, which scored Yuri Masuyama, and a second inning run on a double from Mikiko Eguchi, a wild pitch and a groundout from Suzuka Yamane. In the final four games, Matsuki was one of the hottest hitters, going six for 10 with a double and a triple, driving in four runs, scoring three times. Rena Tatsumi, who has been with Denso for 14 years, went six for nine, four runs scored and two RBI over the final four games and Makiko Tanaka went five for 11 over the final four games with six RBI, three runs scored and a home run on July 8. Matsuki, who is in her fifth year with Denso, said her first impression of the Cal A’s was the size of the players and admitted that in Japan, the players are mostly the same size. But on the other side of the field, the Cal A’s offense was stymied throughout the five games by the pitching and defense of Denso. All five different Cal A’s teams, including the International team from this past Sunday, combined for 21 hits and no one player had more than one hit in any of the games. Iseri, the former Cerritos High star who is currently at the University of Hawai’i, had three hits over the final four games including a two-out single in the bottom of the sixth this past Sunday that broke up Ayaka Okano’s bid for a no-hitter. “Honestly, I was a little bit nervous, but I was more excited than anything,” Iseri said of facing Denso. “I know that they’re the top in the world and just to experience, not only being able to watch them play, but playing against them…I learned so much. They inspire us so much in so many different ways. They have such a different style of playing softball. Iseri added that she was very impressed with Denso’s energy, drive and motivation while on the field, something that she said is ‘over the top’ of what American softball players have. She continued by saying the Denso players were not cocky, but instead confident and that their hard work doesn’t go unnoticed. In the final game, Denso was facing a team that consisted of mostly college players, five of whom are from Oklahoma, the 2016 NCAA National Champions, three from the University of Michigan, and two from the University of Hawai’i, among others. Denso scored five runs in the second inning en route to a 7-0 win. The big blow was a two-run home run from Aoi Yamazawa. Oklahoma’s Jayden Chestnut got the start and pitched the first two innings plus the fifth inning. Arnold, Clifton and college teammate Fale Aviu each had a hit with the other hit coming from Iseri’s teammate on the islands, Nicole Lopez. But playing against the other collegiate players was just another honor for Iseri, although not unusual since she saw them this past season. Even though Denso was in the Southland for one week, the team was completely concentrating on the games. Ito said she wanted to take the team to other places and go shopping. But the whole purpose of coming here was to focus on softball, improve and get something from here themselves. She added that this trip was not a vacation; it was their job, though she wanted to give the team more free time. For the most part, the Denso players practice on defense for about one hour everyday and practice on hitting for about three hours every day. And as softball returns to the Games of the XXXII Olympiad in 2020, with Japan as the host site, Ito said it’s good for the kids to make dreams for themselves. Ito was a member of Japan’s 2000 and 2004 Olympic softball teams in Sydney, Australia and Athens, Greece respectively. Softball was added to the Olympics on June 1 by the International Olympic Committee after being absent in 2012 in London, England and next month in Rio de Janeiro, Brazil. Japan won the gold medal in softball in 2008 in Beijing, China with the USA taking the silver medal.